He will remain in his post and has been ordered to reimburse the government "as appropriate," the Homeland Security secretary said. 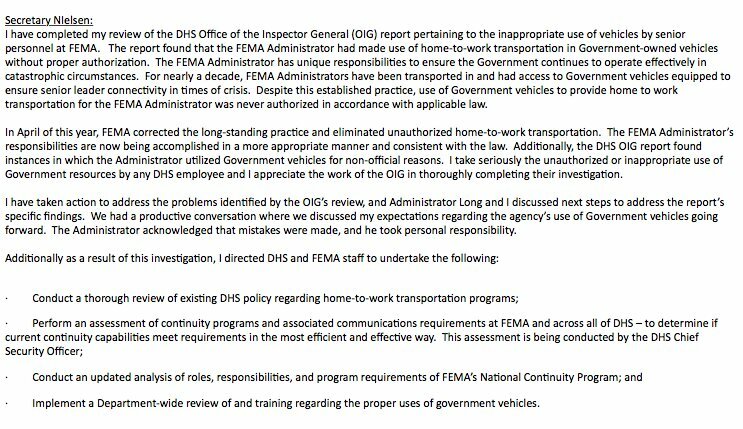 FEMA Administrator Brock Long misused government vehicles and staff on more than 40 occasions, according to a Department of Homeland Security inspector general's report. Brock Long, the administrator of the Federal Emergency Management Agency, improperly has used government resources at least 40 times during his tenure, costing taxpayers more than $150,000, according to an internal investigation. The Washington Post on Wednesday, citing a redacted copy of a report from the Department of Homeland Security’s inspector general, said that the agency found Long had regularly used government SUVs driven by federal employees for personal travel. Many of those trips were to his family home in North Carolina, but one trip involved driving Long, his wife and children to visit the Dole pineapple plantation and a volcano in Hawaii. Long was in the state mixing work and family time, but the sightseeing excursion was made after he had finished government business. The Wall Street Journal was the first to publish contents of the report on Tuesday. Agency investigators watched Long over five months to determine the extent of his use of government resources. The report found that his personal trips cost the government $94,000 in salary expenses, $55,000 in travel costs and $2,000 in maintenance fees. Homeland Security Secretary Kirstjen Nielsen ordered Long to reimburse the government for his personal use of government vehicles “as appropriate” last week, but she did not detail the specifics of how much he’d be required to pay. She also said that he would not lose his job, at least for now. He was on the verge of resigning, the Post reported, but FEMA personnel persuaded him to stay. Officials said last Friday that Long would not face any charges. Long, a career disaster response official, is widely admired within the agency, but Nielsen had reportedly been attempting to replace him over growing frustrations related to his close relationship with the president, among other issues. FEMA is still on the ground in the Carolinas addressing the aftermath of Florence, which has caused widespread damage and left many stranded.